Clay D. Morgan was born and raised in Florida, graduating from Cooper City High School in Fort Lauderdale, Florida in 1979, and obtaining his Undergraduate degree from Florida Atlantic University in Boca Raton with concentration in the area of finance. Clay went on to earn his Juris Doctorate degree from the University of Miami, School of Law in Miami, Florida, graduating in 1987. At University of Miami Law School, Clay concentrated his studies in the area of trial practice. After graduating from the University of Miami, Clay worked for a period of 11 years with the Law Firm of High, Stack, Lazenby & Palahach in Coral Gables, Florida, where he concentrated his practice in the area of plaintiff’s personal injury litigation. While with the firm, Clay tried numerous jury trials representing injured clients throughout the south and central Florida area. During his time with the High, Stack law firm, Clay moved to the firm’s Melbourne office, where he worked his way up to managing partner before opening his own practice in 1997. In 1999, Clay and Patrick Barbary merged their respective practices to form the Law Firm of Morgan & Barbary, P.A., which limited its practice to the areas of personal injury, criminal law, and family law. Since that time, the Law Firm of Morgan & Barbary has grown to five attorneys and continues to concentrate its practice in the areas of personal injury litigation, criminal, and family law. During the last ten years, Clay has handled hundreds of family and personal injury claims for his clients and it is his promise that he will use every firm resource to protect and successfully prosecute your claim. It is his promise that you will receive the best and most affordable legal services to address your legal problem. 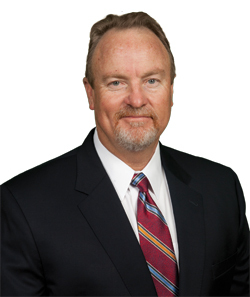 Clay Morgan is a member of the Florida Bar Association, the Brevard County Bar Association, and the Academy of Florida Trial Lawyers. He is licensed to practice law in all Florida State Courts as well as the United States District Court Southern District and Middle District of Florida. Clay and his wife, Maggie, have resided in Melbourne Florida for over 20 year and with their children, Adam, Robert, Emily and Katie, are firmly rooted in the Melbourne community. While he has given up coaching his children in soccer, on any given weekend you will find Clay and Maggie on sports fields throughout the county following their children’s sports endeavors. In his spare time Clay is a fourth-degree black belt in Tae Kwon Do having continued his studies over a period of 30 years. He is a senior black belt instructor at The Family Tae Kwon Do Center in Melbourne where he continues to teach classes weekly and travels throughout the central Florida area to participate in demonstrations and tournaments. His children participate with him. Clay and Patrick are both avid motorcycle enthusiasts and have been riding the roads of Brevard County and central Florida for many years.